Charcot neuropathic arthropathy is a progressive destruction of bone and joints, which is usually caused by unrecognized injury and occurs in people who have peripheral neuropathy. Peripheral neuropathy is a disorder of nerves that results in the loss of protective sensation in the feet, and often the hands, which prevents an individual from detecting foot injury. Neuropathy may have many causes, but occurs most commonly in people with diabetes mellitus and in those who abuse alcohol. Four conditions are required for neuropathic arthropathy to occur. The first is peripheral neuropathy with associated loss of protective sensation and loss of the ability to detect the position of the hands or feet in space (proprioception). The second condition is an unrecognized injury. The injury may be a result of trauma, such as from a fall, a motor vehicle accident or even something as common as bumping the foot into a table leg. In addition, the injury may be a result of overuse or minor repetitive trauma. The third condition is continued repetitive trauma after the unrecognized initial injury, thereby causing further damage. Finally, the fourth condition is adequate blood supply. Continued trauma in the setting of peripheral neuropathy can lead to abnormal regulation of blood flow with a significant increase in blood flow to the foot. 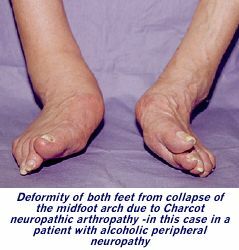 Charcot neuropathic arthropathy rarely occurs in people who have significant peripheral vascular disease with poor blood supply to the foot. The term Charcot arthropathy, or Charcot foot, is named for the French neurologist, J. Charcot, who described this type of fracture and dislocation of the foot bones in patients with peripheral neuropathy. In the 1860s,when Charcot described this problem, advanced syphilis was the cause of neuropathy. It was not until the 1930s that the peripheral neuropathy from diabetes mellitus was associated with Charcot neuropathic arthropathy. In 1966,a physician named Eichenholz characterized three stages of Charcot arthropathy, which describe the changes in the fracture process over time. The first stage is called “dissolution.” This involve fragmentation of bone, dislocation of joints, and the loss of bone mass because of increased blood flow. Clinically, the foot or ankle appears swollen, red, and warm, and it is often difficult to distinguish these findings from an infection. This stage can last from days to several weeks. “Coalescence ” characterizes the second stage. In this stage the bony fragments are healing and organizing and there is new bone formation. The foot now appears less red and swollen. Finally, “resolution,” as the third stage, evolves over several months. The bone fragments smooth over and the bony density increases. The foot or ankle displays permanent enlargement and fixed deformity due to the bone fragments and joint dislocation healing in a displaced position. The skin color and temperature gradually normalize. After the evolution of the Eichenholz stages and the formation of a neuropathic Charcot joint, both the patient and physician are left with a challenge. The foot or ankle is enlarged and has fixed deformity. Shoes are now difficult to fit because of the abnormal shape, and ulcerations easily form from high-pressure areas. Functionally, the foot or ankle may be unstable and exhibit loss of normal position. The midfoot region is the most common area to have joint destruction and resulting deformity. The midfoot will collapse and the arch will fall such that there is a bony prominence on the bottom of the foot. This results in ulceration forming on the bottom of the foot over the prominence. Charcot changes in the ankle or heel area often result in instability or severe deformity. Physicians may encounter a Charcot foot or ankle at any of the three stages described by Eichenholz, and their goal is to diagnose peripheral neuropathy, recognize the Charcot changes, and attempt to halt the process to prevent further deformity of the foot. People who first develop peripheral neuropathy may complain of pain and tingling in the feet and toes. Often just a rush of air or the sheets resting on the feet will cause irritation and pain. The most dangerous characteristic of peripheral neuropathy is that most people will not know that they have lost sensation in their feet until it is too late. Physicians can detect loss of protective sensation by using a special monofilament testing device. If patients cannot feel the plastic filament when it is touched to their feet, they are given the diagnosis of having “feet at risk.” The key at this point is prevention of ulceration and Charcot arthropathy. When encountered in the first Eichenholz stage, it may be difficult to distinguish a Charcot arthropathy from an infection, since both exhibit warmth, swelling, and redness. Blood tests may be equivocal. However, in the scenario of infection, there may be an associated ulcer or wound. In addition, in patients with diabetes, poor glucose control is usually evidence of infection. Finally, a special nuclear scan or magnetic resonance imaging (MRI) can often help distinguish between Charcot changes and infection. Stage one Charcot arthropathy is typically treated with a special type of casting called a total contact cast, which is applied in layers with the goal of achieving a “total contact fit.” The cast works to control swelling and protect the leg from further damage. It also allows a patient to put some weight on the leg to ease ambulation. The cast is usually changed within one week to accommodate the decreased swelling and then every one to three weeks depending on how quickly the leg and foot decrease in size from the resolution of swelling. Treatment time in the cast is usually eight to twelve weeks, or until healing has reached stage two. Once Eichenholz stage two arthropathy is achieved, the immobilization continues either in a cast or a custom cast brace for up to six months, or until the swelling has resolved and healing occurred. After final healing has occurred, bracing is usually necessary to accommodate any possible deformity. Braces are usually custom molded if there is any deformity, and they extend from just below the knee all the way to the toes. A Charcot healing brace is a molded “clamshell ” that completely surrounds the leg and foot. It functions like a removable cast. Finally, in stage three Charcot arthropathy, the damage has been done; the acute phase of swelling and redness has subsided, and the patient may be left with deformity and instability. Special shoes and/or braces may be necessary to support the foot to prevent further injury and ulceration of the foot. Sometimes surgery is the only way to make bracing and the use of footwear possible and help prevent amputation. This may involve a relatively minor procedure to remove bony prominences that may lead to ulceration, or it may involve advanced reconstruction and realignment procedures that include fixation with pins, screws, plates or external fixation devices to hold the realigned bones until healing has occurred. There is usually an extended period of casting after surgery, before final bracing. Complications of surgery include infection, wound breakdown, healing in a poor position or no healing at all of the bones. In addition, ulcerations can still occur. The success rate of surgery is about 80 percent. What about amputation versus surgical reconstruction, given the complications that are associated with surgery? Amputation of the foot between the ankle and the knee is a surgical option. However, along with the psychological and social consequences of amputation, increased energy is needed to manage with a below-the-knee prosthesis. Also one can never predict the long-term status of the other foot. In an effort to avoid amputations of both legs, usually surgical reconstruction is favored over primary amputation. Amputation is typically reserved for severe infections, surgical complications, or for the patient who is not able to withstand the reconstructive surgery with the prolonged healing time. wearing appropriate and well-fitting footwear. Physicians, podiatrists, and shoe salespeople need to be informed of peripheral neuropathy when present. Specially designed shoes and shoe inserts can help protect “feet at risk ” by reducing the pressure of walking on the feet. As a progressive, destructive, noninfectious process, Charcot neuropathy presents a challenge to both patients and physicians. It is sometimes preventable, and successful treatment requires early detection. Once deformity has occurred, further damage, ulceration, and amputation are much more likely. However, these problems are largely preventable with the appropriate knowledge, skill, and often some good fortune. Dr. Jeffrey E. Johnson is associate professor, chief, Foot & Ankle Service, Department of Orthopaedic Surgery, Barnes-Jewish Hospital at Washington University School of Medicine, St. Louis, Missouri. His practice is limited to all types of foot and ankle problems, including: trauma, post-trauma reconstruction, acquired deformities of the forefoot, midfoot, hindfoot and ankle, neuromuscular deformities and complications related to diabetes.